Jackson & Perkins is proud to sponsor with the American Heart Association® and its Life is Why We Give™ campaign! The American Heart Association® (AHA) is a voluntary organization dedicated to fighting heart disease and stroke, with the mission to build healthier lives, free of cardiovascular disease and stroke. Through their Life is Why We Give™ campaign, donations can be made to help the AHA continue to conduct breakthrough research, engineer life-saving technology, and build healthier communities. 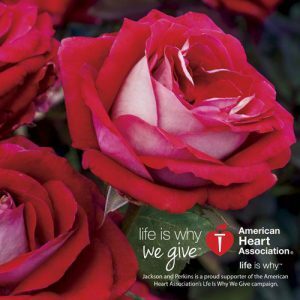 The Grateful Heart™ Rose is Jackson & Perkins’ way of showing our unending support to the American Heart Association. We think that the Grateful Heart™ Rose is a great way to represent the AHA’s hard work and success in building a healthier nation. For some of us here at Jackson & Perkins, this cause hits close to home. Paul Ambrose, President of Jackson & Perkins, sadly lost his brother to a heart attack in March of 2015. There were no visible signs of an imminent attack. Paul recounts his brother Rob as an amazing father, son, brother, neighbor, coach, coworker, community leader, and best friend. Unfortunately, the story of Rob Ambrose is not unique. The AHA reports that 2,200 individuals die from heart disease every day. Heart disease is the #1 cause of death in the world and the #1 cause of death in women in the United States. Having a grateful heart means giving constant support to a person or cause for which you are grateful. At Jackson & Perkins, we are grateful for the work and research that the American Heart Association® does. The Grateful Heart™ Rose is our way of showing that appreciation to the AHA. This rose is a perfectly sculpted hybrid tea rose in a beautiful red hue. It is subtly fragrant and helps support this wonderful cause! Jackson & Perkins will donate $5.00 from the sale of each Grateful Heart™ Rose directly to the AHA. So while you grow and enjoy these magnificent blooms, you are also helping the fight against the world’s foremost killer: cardiovascular disease.